Before you sign your name to a credit card application, make sure that you haven't intentionally included any misleading information. 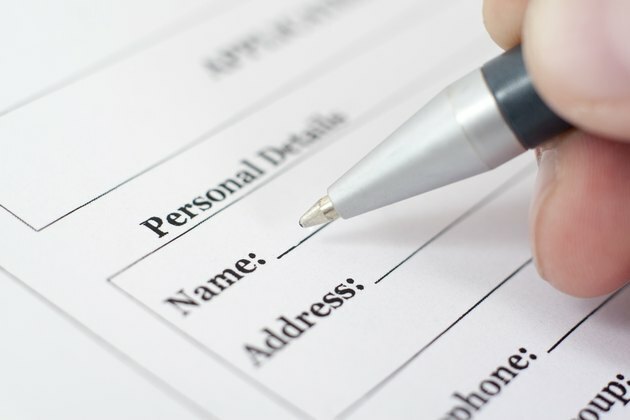 Credit applications require your signature as a way to confirm that the information you have given is accurate to the best of your knowledge. Creditors will forgive an honest mistake. But if you give false information for the sole purpose of obtaining credit, you could find yourself answering to the law. You can be charged with identity theft if you enter another person's name or social security number, or any personal information other than your own on a credit application. Conviction for identity theft carries with it some potentially hefty penalties. In fact, the Identity Theft Penalty Enhancement Act signed into legislation in 2004 established identity theft as a federal crime. The law sets the penalty for identity theft at up to 15 years in prison and paying as much as $250,000 in fines. You can be found guilty of committing fraud if you lie about your income on a credit application. Giving false information to obtain credit or a loan can get you into both financial and legal trouble. If you inflate the value of your assets or state that you have an income higher than you do, you could face criminal charges, especially if you default on the loan. The punishment for falsifying information if convicted can involve jail time and payment of fines. You may be subject to a creditor taking direct action against you if you give false information on a credit application. Lying about your income on a loan application to purchase a new car can not only get your loan cancelled, but will get your car repossessed as well. Repossession shows up on your credit report. Actions other creditors who check up on you may take include cancellation of your credit card or line of credit. The worst part is that it is highly unlikely that the creditor or lender will ever extend you credit again. You can ruin your credit if you provide false information so that you can be approved for credit for which you would not otherwise qualify. It doesn't pay to lie on credit applications just to make it easier to get a mortgage loan. You may think that you can get away with it if you apply to a loan program that doesn't require the borrower to show proof of income in the form of paycheck stubs or W-2 forms. If you can't keep up with the loan payments, your home could go into foreclosure in the end. You could also go to jail for lying on your loan application. You can be charged with crimes such as theft by deception and larceny if you lie on a credit application to qualify for a higher credit limit. While the penalties may vary, conviction of these charges can result in jail time, fines, probation, community service or a combination of more than one of these penalties. Jail time can range from several months to several years. You may find yourself with a number of financial woes if you falsify credit information on an application through your bank. If a bank proves that you have been fraudulent, it can cancel any checking or saving accounts you have with that bank. This could make it difficult for you to open money accounts at other banks and financial institutions.